Unlike in Florida where our family had a 15 minute drive to the practice fields, here we have no more than about 8 minutes to any of the numerous practice fields our boys are practicing at. Timmy’s team has numerous locations depending on what kind of practices they’re having, including an indoor facility which is great for skills development. Jacob’s practices are at the park right up the street. That was pure good luck for us. And is also why Jacob has a new wheeled baseball bag. Since I’m usually in the midst of running Timmy to and from his practices (which are not only at different locations but also at differing times during the week), it’s great to simply tell Jacob “You can head over to practice at 4:15pm). At least one of the boys is in baseball practice 5 nights per week. The season starts the first weekend of April, and games will replace many of those practices. They each have 18 regular season games, plus the tournament around Memorial Day. 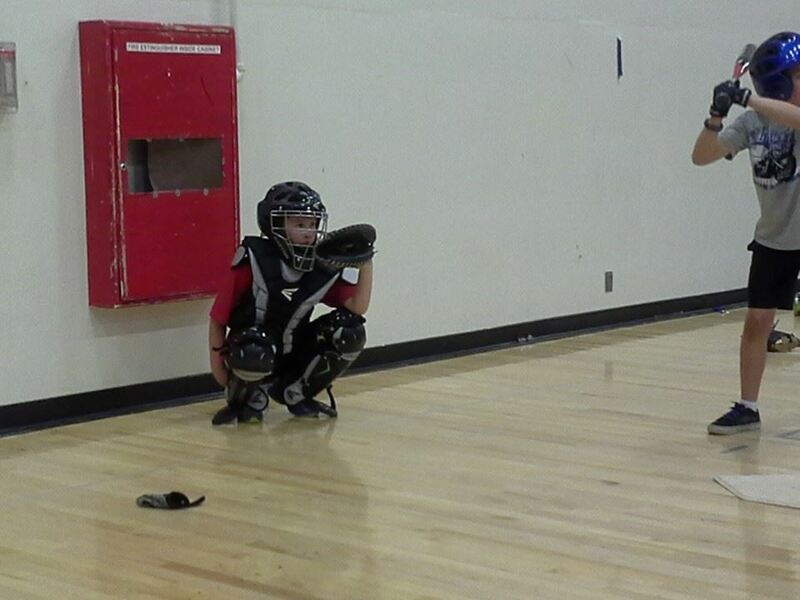 The boys are working hard at their baseball, but loving every minute of it. I can’t believe we found a program as intense as what we had in Navarre. 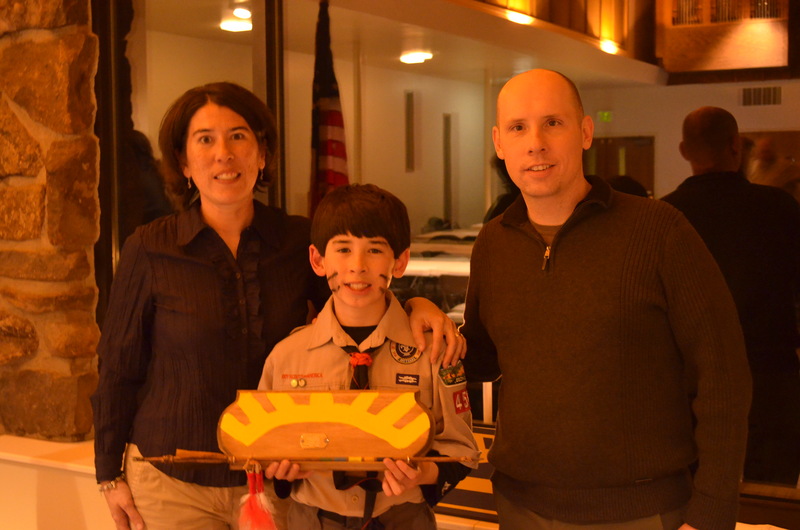 Jacob’s crossover into Boy Scouts. Pardon the strange color. Jacob kept blinking with the flash photography. He has an Arrow of Light Award. He had to build and decorate the arrow himself. Jacob is really enjoying his new Boy Scout troop. He crossed over at the end of February and didn’t waste any time getting involved. He’s in a patrol full of boys with similar interests to him, and the boys seem to be very kind with him. (I was expecting something more like a fraternity pledge experience with the new kids, but that hasn’t happened). Jacob has already earned his “Scout” rank, and had the chance to earn the Railroading Merit Badge at a train show in Denver earlier this month. Dave is training to become an Assistant Scoutmaster, he’s thrilled to be helping mentor older Scouts, like he did with a BSA troop in Korea over 15 years ago. 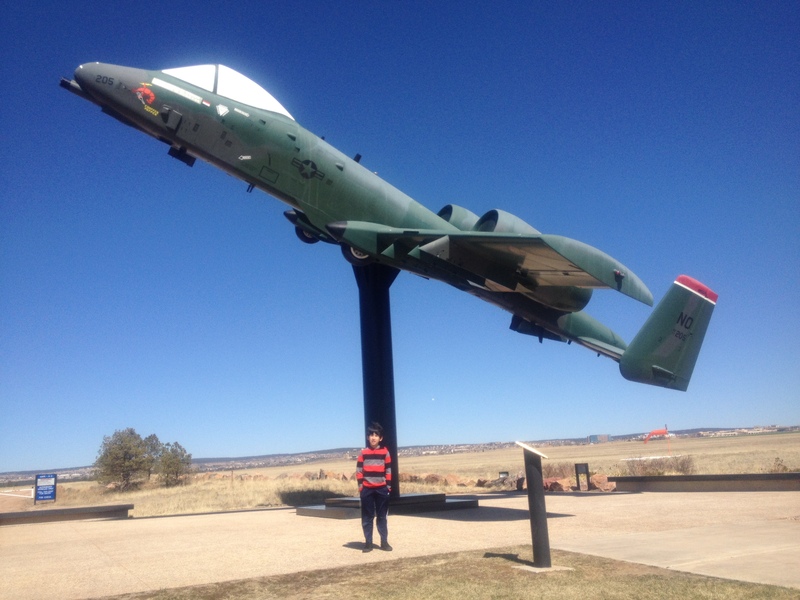 A little bit of sightseeing at the AF Academy. Jacob is quite sad that his A-10 is being programmed out of the USAF inventory. We also have been getting more skiing under our belt. We’ve taken one more trip this past weekend, again to Monarch Mountain. The boys are getting better with every trip. Timmy consistently skis on the blue trails, while Jacob does a mix of blue and green trails. Now we need to get Timmy to pay better attention at the lifts: he was knocked over by the chair twice last weekend, and also he had a ski pop off just as he was getting on the chair. He takes it all so well, though — pressing on as if nothing happened. Our next ski trip will be a biggie: we’re visiting Crested Butte for a few days over spring break at the end of March. Winter is slowly wrapping up here; with the days getting longer, it’s difficult for Mother Nature to keep the days as cold. March is indeed very windy here, and has come in like a lion, with intense cold fronts 1-2 times per week. I’ll send the boys to school in their heavy coats with morning temperatures in the 50s…because it is not unrealistic for the temperatures to be in the 30s with snow on the ground by the time they walk out the door (it happened last week!). In fact, we’re expecting our next cold front as I write this: we have a dust storm warning in effect for today. We are looking forward to spending more time outside, between baseball, Scouts, the mountains, and local parks calling our names.